Click here for a definition of the categories. The Organisers reserve the right to cancel, postpone or otherwise make any changes with respect to the seminars/workshops as may be necessary. 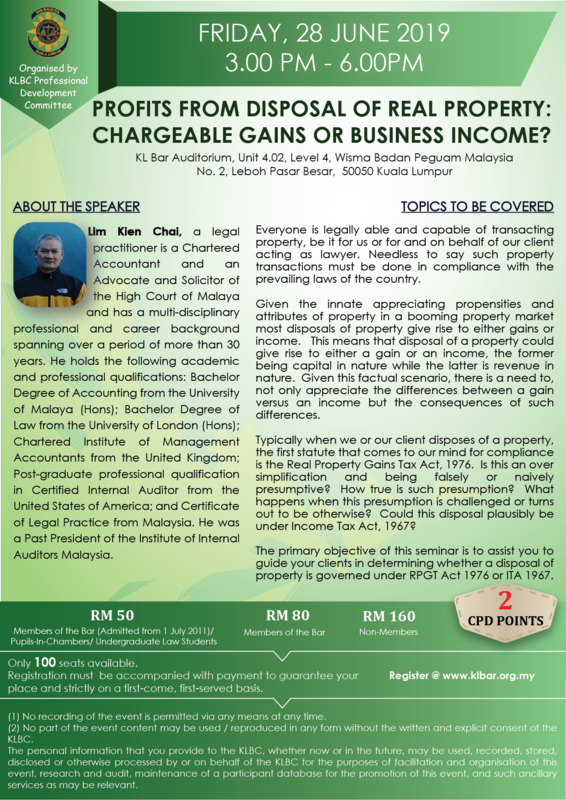 Fees paid are non-refundable unless the seminars/workshops are postponed or cancelled by the Organisers. If a participant is unable to attend, a replacement is allowed but the Organisers must be informed either before the event or during registration. The registration counter will be opened for registration half an hour before the start of the seminar/workshop on the day of the event. Please be punctual. • You must participate in the Event until its completion including the Q & A Session and be present throughout the Event. • Latecomers (15 Minutes after the start time) and those who leave early will not be entitled to receive the CPD Points. • CPD points will only be provided upon filling up the Evaluation and Feedback Form and returning it to the Registration Desk AT THE END OF THE EVENT.